Normally this pumpkin spiced time of year you’d find me (a) cursing the hashtag #30daysofthanks (who has the time for that crap, seriously?!) and (b) inserting the hashtag #goodtimes with a hearty helping of sarcasm. I’m happy to report I’ve felt a shift, and by that I don’t mean I’ve had to loosen my belt by a notch or two. What ‘sup? A seasoned autism mom I respect immensely served up this comment, in response to my post about the pitfalls of autism helicopter parenting: give in or embrace the [autism] journey; there is no in-between. Now let’s talk turkey: those words forever changed me, and it’s not just because my twelve-year-old son is twice my size and currently can’t finish a sentence without referencing Santa Claus (see photo evidence to your left). It is because time flies (see photo evidence to your left, taken 3 full weeks before Thanksgiving). I have chosen the embrace, without a single reservation. Maybe it’s what I’ve hungered for all along? 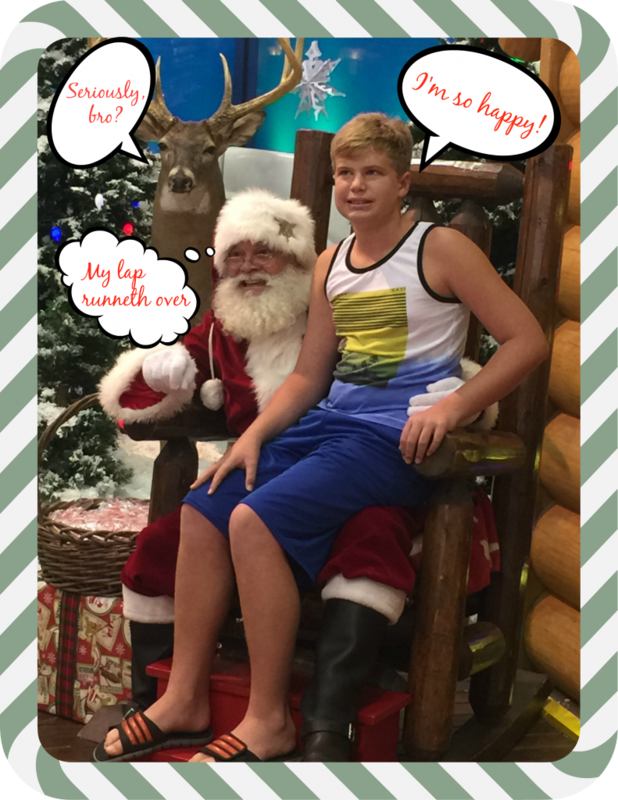 Consider the publishing of J.R.’s photo with Santa my “coming out.” Oh and F.Y.I., he was ECSTATIC in that moment. Think Will Farrell as Buddy Elf. Here’s the meat and potatoes: combine wit, hilarity, caring (except in the case of his little brother), and fold in a smidgen of soul– that’s my kid. Also on the menu? For starters, he often wins at arguments against me. That is hard to swallow! Last month he proclaimed his love for the parts of speech, even the adverb. This month he’s obsessed over the Spanish language and has asked me to teach him nearly every word in it. I have, and el placer has been all mine. My just deserts? Te quiero, mi hijo are now my parting words to him as he heads to bed each night. My life with J.R. so far has been a feast for the senses. And although it’s been a struggle to not want to pepper his successes with asterisks, I feel star reviewed every single time he looks my way. And in all honestly, fighting the battle of the bulge has been exhausting. I can’t restrict my son from the head table of life anymore, even if I wanted to. I am a small bite to his smorgasbord. Hold onto your forks, people: I don’t mean to turn up the heat and suggest I embrace autism itself. I have little taste for that mindset. Rather, I grasp and cling to the fantastic person my son has become in spite of everything he’s been through. From soup to nuts, my potluck life with J.R. has been anything but bland. In fact, we’re gearing to spice things up around here. It’s about that time again we welcome some elfin magic into our home. To sweeten the pot J.R. has deduced our Elf on the Shelf, who we named Chippie, must have a birthday. And we must therefore throw him a birthday party (and pizza feast) upon his arrival. Of course we do. And like a boss short-order cook, you guessed it, I am all in. I truly cannot wait. If you’ve met me, you know Chippie’s gift is already wrapped (he’ll be receiving a denim jacket and a pair of Converse). This outfit should not be confused with his actual birthday outfit, which I think may require a quick iron. Is this embracing or embarrassing, I wonder? As I take the time to skim through the links included in this blog entry (past the cornball buffet of clichés), it’s as easy as pie to see a pattern. I rant about autism, and eventually rave review the young man who has it. Skipping the first course, maybe, will remind me just how bountiful a plate I have. How great the course of my life has been compliments of my ambrosia, my J.R.. Great and full. Sweet!